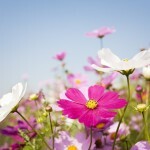 When considering wildflower Annuals versus Perennials. 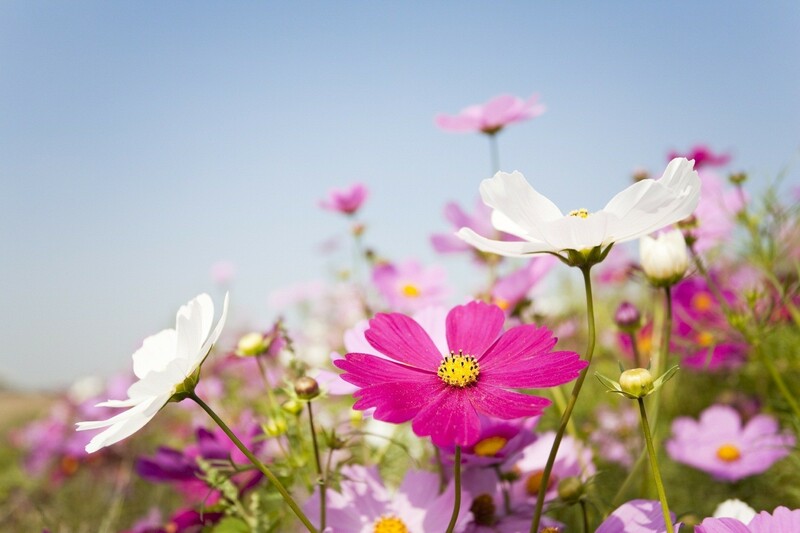 There are two main types of wildflowers annuals and perennials. Annuals are short term and need to self-seed or be reseeded every year. Perennials once established grow back each year even if they had been cut back. To complicate life slightly there are a small group of biennials these are species that flower every other year. In the case of planting either of the main type of species it is best done if the ground is cleared first so that you have a good even level seed bed. In terms of Wild flowers these broadly fall into two categories native and non-native. 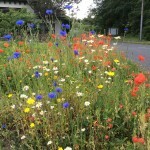 The native annuals include such species as Field Poppy, Cornflower, Corn Marigold and Corn Cockle etc. These species can be found growing in the wild naturally here and stocks are then multiplied up. The non-native Annual species includes ones such as Cosmos, Godetia & Marigold. These grow naturally in the wild elsewhere and have been introduced into this country. You would sow these Annuals species at about 2 to 3 g to the square metre. Whilst you can sow individual species they are generally sown as a mixture. This way you reduce the risk of failure but also extend the flowering season. 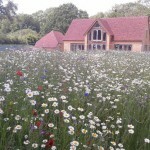 As a general rule the native Cornfield Annuals can be sown in the autumn or spring. Field Poppy in particular prefers to be sown in the autumn. The non-native species generally need to be sown in the spring mid March to mid May assuming that the weather conditions are OK. The native species can take somewhere between 10 to 12 weeks from sowing to flowering. The non-native species can be quicker taking in some cases from 8 to 10 weeks. Annuals tend to prefer slightly more fertile conditions. They can give a very colourful long lasting impact show over the summer at a relatively low cost per square metre. 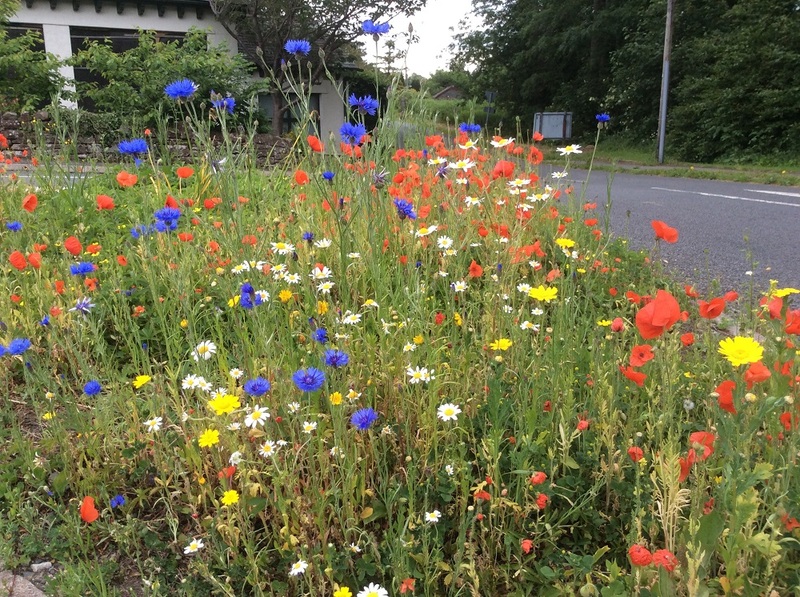 The non-native mixtures have become very popular in the last few years with many councils planting them to create natural colourful flowerbeds. They can last until September and in some cases have lasted through until October. These take longer to establish but once they are established they will come back year after year. Their natural habitat is to appear with grass as the back drop. Our advice generally is that if you're starting from new you sow a mixture of grass and perennial wildflowers. If you are sowing into existing grass you need at least 50% bare soil and then you could sow just a 100% perennials seed mix. 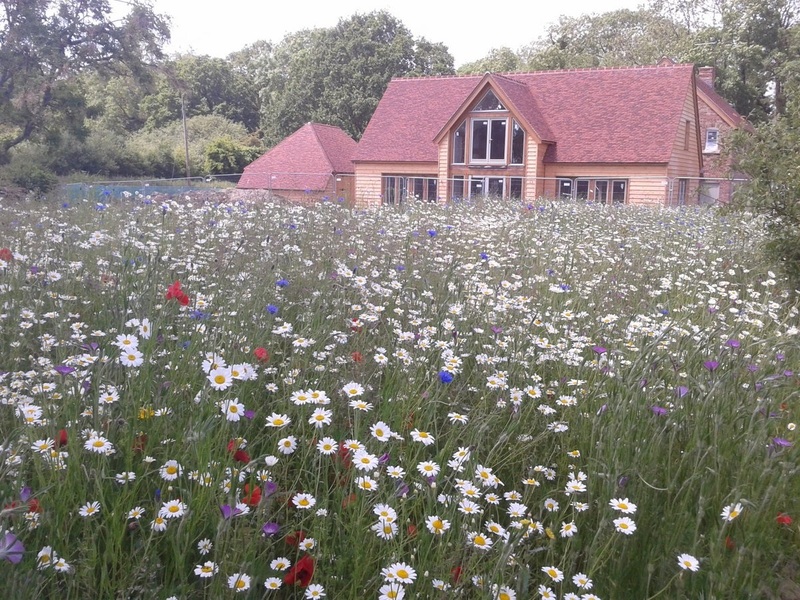 The grass and wildflower seed mixes are generally sown at 4 g to the square metre, pure wildflower seed mixtures at 1.5 g. The key with perennials is that you plant species that match your conditions. In simple terms this might mean just matching the soil type whether it is Clay, Chalk or Sandy etc . Or matching if it is woodland or wet ground. The ground needs clearing completely before you sow a grass and wildflower seed mix. The seeds should be broadcast and then rolled afterwards. It is unlikely that you will see many flowers in the first year of the meadow. They should start to be more developed from the second year onwards and then continue to change over time. Perennial mixes are generally relatively complicated. With the idea being that you end up with different species at different heights and different colours over the summer. Ideally with an attractive natural grass mix as the back drop. Once established a perennial meadow is a haven for wildlife attracting butterflies and bees etc. It can be left to grow out over the summer and will just need cutting down at the end of August early September. When considering Annuals Versus Perennials in some cases people sow a mixture of annuals and perennials together so they get some colour in the first year and then a perennial meadow comes up from the second year onward. If you need any more specific information please feel free to contact us. Whilst we have a wide range of standard mixes we are happy to help you develop a bespoke mixture for your site or to quote for one if you already have a mixture designed.